Guy Montag is a firefighter in a society where, instead of extinguishing fires, they light them. The fire department is in charge of burning books, which are now illegal and despised. One night, walking back from the station, he bumps into a young teen girl named Clarisse. Her unusual viewpoints cause Montag to slowly question the society and his place in it. As his curiosity about the books he burns grows, Montag begins stealing and reading books. Gradually realizing the importance of the content he reads, Montag begins behaving erratically, attracting the concern of fire department Captain Beatty. One night, Beatty comes to tell Montag the true story of the fire department. He explains that long ago, firemen used to put out fires, but the invention of fire-proofed buildings rendered their services useless. Instead, they were assigned to burn books, which are now viewed as weapons against equality. Beatty explains that when happiness is placed as the most important goal, everything and anything controversial must be removed. He reminds Montag that the procedure for keeping a book is to turn it in within 24 hours. However, Montag ignores his warning and refuses to give up his books. As he thinks more about the content of the books and society’s hatred of them, Montag changes his opinions until his wife, his captain, and all but one man are against him. Montag’s wife Mildred, who is addicted to the television on the parlor walls, begins burning Montag’s books in the household incinerator. Realizing that his time is running out, Montag teams up with the only man not against him, Faber. Faber, a former English professor, helps Montag realize what needs to be done, and together they plan to overthrow the Fire Department. In the beginning of Fahrenheit 451, it is shown through two characters’ dialogue that this story takes place in the future. 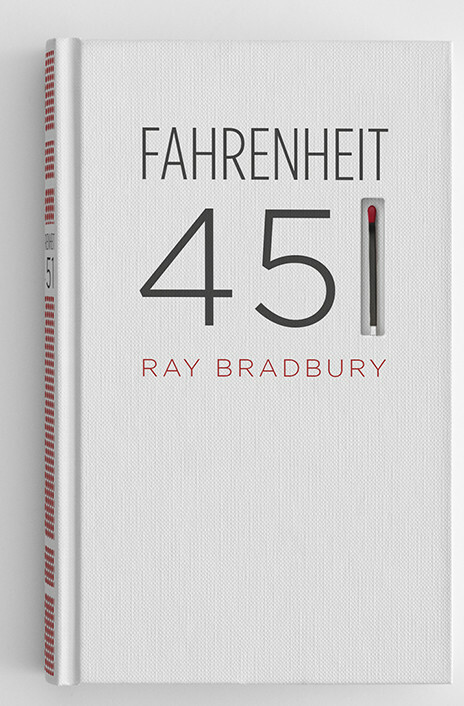 The idea of book burning as a form of censorship was influenced directly by the Nazi book burnings, and I found it interesting that Bradbury took things from the past and present and placed them into a futuristic setting. I enjoyed the personality of a side character, Clarisse, who appreciates natural entertainments like tasting the rain and walking at night. She influenced Montag into appreciating the simpler things around him. I also liked Montag’s changes throughout the entire book, as he tries to solve the puzzles of his society. At first, he seems to be a tough fireman like the rest of his coworkers, but it is soon shown that he has a more sensitive side. However, the book mainly centered around active male characters, and all the female characters do not physically take action that directly affects the main character, Montag. I found this subtle but, once noticed, extremely vexatious. This book would be suitable for ages thirteen and up. I would rate Fahrenheit 451 nine out of ten stars. 1. What are the possible ways Montag believers he noticed Clarisse with? 1a. He thinks that there may have been a faint perfume scent, a small temperature rise from body heat, and the sound of someone walking. 2. What does Clarisse say that irritates Montag? 2a. She points out things that he has not noticed before, such as the dew on the grass in mornings and the man on the moon. He feels uncomfortable because she knows so many more simple things that he does, despite Montag being older. 3. What did the operators do for Mildred? 3a. They removed the contents of her stomach and replaced her blood. 4. What does Mildred’s obsession with television show? 4a. It shows that in this society, people are disconnected from the real world and depend on their entertainment. Mildred is eagerly willing to spend a third of Montag’s yearly pay for a fourth wall-TV. 5. Why does Montag feel so divided when Clarisse asks him about his job as a fireman? 5a. One side of him is fiercely proud of his job, as he loves the exhilaration of burning the books and buildings. However, part of him feels unhappy, and he knows that his personality is not as cold and harsh as his coworkers. 6. Why does the burning effect Montag in a different way than most fires? 6a. The owner of the house and the books is still present at the scene, and Montag feels as if he is actually harming something, as opposed to before. Later, when the lady refuses to leave and dies with the books, it traumatizes him and makes him wonder why she wanted to protect the books so much. 7. What is the cause of the distance between him and his wife, Mildred? 7a. He blames the television for drawing Mildred away from reality and into the television shows. 8. Why is Montag so nervous when Captain Beatty visits his house? 8a. Montag has stolen a book from the previous burning, and he hid it under his pillow, an obvious spot. Having books is against the law and is largely looked down on, so Montag is scared that Beatty will find it. 9. How has the Constitution changed over time? 9a. Intelligence is now a trait to be ashamed of, as society now values people being made equal, rather than just being born and treated equal. In order to prevent people from feeling inferior to others, Firemen burn books, which are viewed as weapons against equality. 10. Why are the women not concerned about their husbands going to war? 10a. The government has convinced them that the war will be over quickly, and one of the ladies, Mrs. Phelps, does not have a strong relationship with her husband. She states that her husband advised her not to cry and simply remarry if he were to die. 11. How does Mrs. Bowles interpret Mrs. Phelps’ tears? 11a. Mrs. Bowles uses Mrs. Phelps’ sobbing to claim that poetry simply hurts people and is depressing. 12. Who causes the trouble that Montag is in and what did she do? 12a. Mildred brought the book back into the house and sounded the fire department alarm, putting Montag under arrest and forcing him to burn his house. She then takes the car and drives away. 13. Why does Montag believe that Clarisse has walked the railroad tracks before? 13a. As he is walking on the railroad, Montag is finally able to fully see and appreciate all the nature around him which Clarisse was enamored with. Montag thinks that Clarisse’s love for nature was inspired by the same place he is now. 14. Why do the police pretend to have caught Montag? 14a. They need to have a quick ending to the drama in order to keep their audience interested, and Montag successfully threw them off, so the police find a scapegoat to end the chase quickly. 15. Why doesn’t Montag miss his wife and states that he would not feel sad even if she died? 15a. Montag realizes that Mildred never really did anything of value and people are remembered and missed for what they did.